Media in the People’s Republic of China rarely, if ever, offer the straight scoop on what is happening politically. But sometimes the odd twist in the Party’s stiffened discourse can give us tantalizing clues — little morsels to feed our curiosity. The construction “finding honor in ____” (以……为荣) is routinely used in the discourse of the Chinese Communist Party, with phrases like “finding honor in labor” (以劳动为荣) and “finding honor in hard work and frugal living” (以勤俭为荣) appearing relatively early in the Party’s history. So why should the idea of “finding honor in returning home for dinner” (以回家吃饭为荣) be of interest to anyone? First, we must consider those situations in which one might not return home for dinner — assuming one is a Party official. First, you might be too busy at work. Second, you might be treating others for a dinner out. 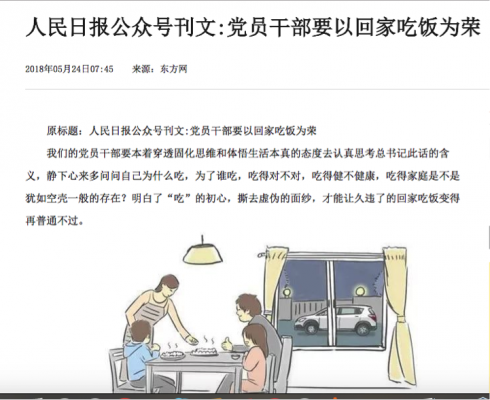 This novel phrase, “finding honor in returning home for dinner,” is directed at the second scenario. 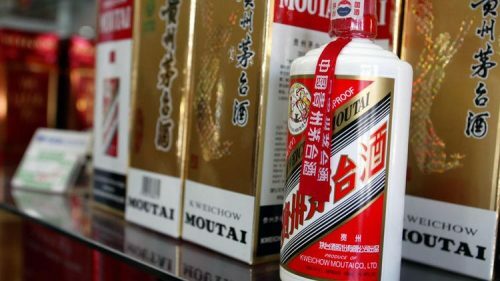 Sales of luxury Moutai liquor, which had dropped during the first years of Xi Jinping’s anti-corruption campaign, have now recovered. 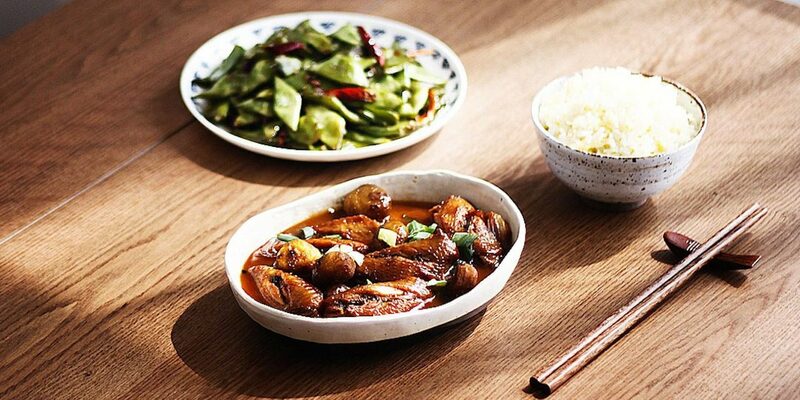 The drink, which can cost hundreds of dollars per bottle, has long been a mainstay of Chinese banquet-style dinners. Back on January 22, 2013, quite early in his first tenure as general secretary of the Chinese Communist Party, Xi Jinping addressed Party leaders at a conference of the Central Commission for Discipline Inspection, the CCP’s anti-corruption body. In his speech, Xi urged leaders to “go out less for entertainment, and return home more often to have dinner” (少出去应酬，多回家吃饭). The admonition was directed against the widespread abuse of public funds by officials holding lavish dinners out, often with expensive liquor, while ostensibly doing the business of the Party-state. 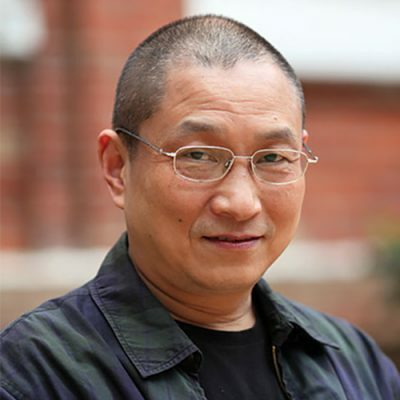 For the idea of “returning home for dinner” to become mixed up with this moralistic discourse about “honor,” and for it to be elevated in this way politically, suggests that while the Party has actively pushed an anti-corruption agenda under Xi Jinping, and has sought to restrain the use of public funds for evening entertainment, the problem is still widespread enough to cause concern. The People’s Daily public account pointed out that there are now people who “have transferred eating and drinking activities from hotels to private residences and work unit dining halls, who have gone from the extravagant use of public funds to relying on their bosses.” Also criticized was the conduct of some Party members in ostensibly using their own wallets to “organize the department” (组局) for dining out. All of this subtly remonstrative language in the People’s Daily public account article, directed at officials inclined by force of habit and privilege to stuff themselves at public expense, drew mockery from internet users who lack even the opportunity to dine on public funds.